THE PROJECT: A careful and unbiased account of how human understanding works. John Locke, of tabula rasa fame from CHOW, demonstrates that you don't have to know a lot or think very clearly to get widespread recognition. This principle would pave the way for such figures as the Spice Girls, Rush Limbaugh, and vice-presidential candidates. For class, we read from An Essay Concerning Human Understanding (not to be confused with Hume's Enquiry Concerning Human Understanding). One of the ambiguities that haunt the Essay is that we're never really sure what Locke means by "ideas." His definition seems to allow for mental images, but we're left in the dark as to what he thinks about propositions or any other objects of knowledge. We will find that Locke's problems are not so much in his assertions per se as they are in his dogmatic assumptions and undefined terms. In Book I, Locke seeks to articulate different theories about innate ideas and refute them. The first theory is that there are innate impressions. In other words, everyone shares a certain number of mental images. Locke really beats this view into the ground and has no fear of contradiction -- probably because no one seems to have held that view in the first place. The other possibilities are that the human mind has original principles and judgments, unless you are a child or insane (close to Descartes' idea); also, it may be that the human mind is constructed to process ideas in a certain way (Kant). Locke refutes all of these by saying that there are no universal ideas, pointing out children, idiots, and atheists as his examples. 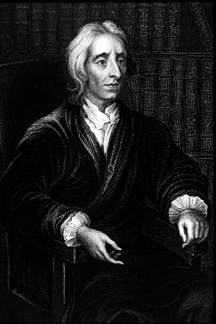 The doctrine of innate ideas is further refuted by the fact that Locke can come up with another explanation -- he can show that all ideas can be produced by experience. This demonstration dominates the rest of the Essay. Book II serves to "explain" Locke's ideas about ideas. He does this through a series of distinctions, the first of which being between Sensation and Reflection. Sensation is, oddly, the operation of our five (or six or seven) senses. Reflection is, first and foremost, our perceptions (unification & interpretation of sensory data) plus pleasure, pain, emotions, and Existence (Existence as a reflection is a real snag). Heather wonders what Locke means by "idea" -- especially indestructible ones. The next distinction is between Simple and Complex ideas. Simple ideas are unanalyzable and "indestructible" (yes, yes, I know). Some examples are color and solidity. Complex ideas are produced by combining, abstracting from, or relating Simple ideas. The final distinction is between Primary and Secondary qualities. Primary qualities are the real, original qualities (Locke enjoys explaining things by using a Thesaurus) that can't be separated from objects and are produced by operations on the senses. They actually resemble the object. Why? They just do, ok? Secondary qualities are qualities that produce ideas in us, and they are merely modes of primary qualities. This is where we talked about the problem of depth perception. In Locke's view, your judgment tells you. Book III is Locke's philosophy of language. Some careful analytical work, here, let me tell you. Book IV is Locke's discussion of Knowledge and Probability. He defines Knowledge as the perception of the connexion and agreement between ideas. The different kinds of agreement are identity, relation, co-existence or necessary connexion, and real existence. If you're unsure how to differentiate these, don't worry -- so is Locke. However, he does subdivide into three kinds of knowledge. Intuitive knowledge is immediate awareness, the blindingly obvious (light of nature?). Demonstrative knowledge depends on intuitive knowledge for building blocks and accuracy of the logical movements, but it's basically seeing the relation between ideas by seeing one relation, then building another relation on top of it and so on so forth. Normal people call this "deduction." Incidentally, it is this type of knowledge that God's existence falls under. Sensitive knowledge is our perception/knowledge of objects outside ourselves. This is the least certain category of knowledge, mostly because it's unsupportable by his system.